Mr. Okama isn’t just a person, he is a place where crazy things happen. I’ll analyze the volume with the attention it deserves, taking into account his own comments when they’re available. Okama draws attention to the background. Well, the background is largely food stuff. Modern Japan is food crazy (Cibo Matto). Okama says that he was trying to go for the loli look but he couldn’t stop himself for drawing big foreheads. Actually, lolis should have big foreheads, but Okama is right in the sense that this isn’t how they’re usually drawn. Why is he obsessed with big foreheads? Why not? That’s my question to you? Why not? The funny thing is that Okama comments on the “Camellias” story that follows this and says that he thinks it’s toned down enough to sell in America. And then he puts this right at the beginning of the book. Hmm, I don’t think he cares about being in bookstores in America. This man was caught doing, or suspected of doing, or accused of doing something with someone younger than himself. He has been ostracized by society. He goes to the woods to escape society and finds what he was looking for. The ontological status (=real, metaphorical, fantastic) of the girl of the camellias is up to the reader. Okama tells us he’s imitating Ashito Oyari here. He also tells us he wasn’t confident he could draw the bottom parts well. I’m sure it’d be very difficult to portray those accurately. We can learn a lot about Okama from looking at this picture: the girl wears tons of spikes and all her friends are blowfish. This is an accident waiting to happen. Life is an accident waiting to happen. Even if the blowfish manage to get out of the way, the spike on her right leg will injure her left, believe it. The Moonlord is a loyal servant. Girls are never lacking loyal servants in Okama’s world. Okama doesn’t seem to share my opinion, but everything about this picture tells me that this lettuce lady is about to die…and she knows it. 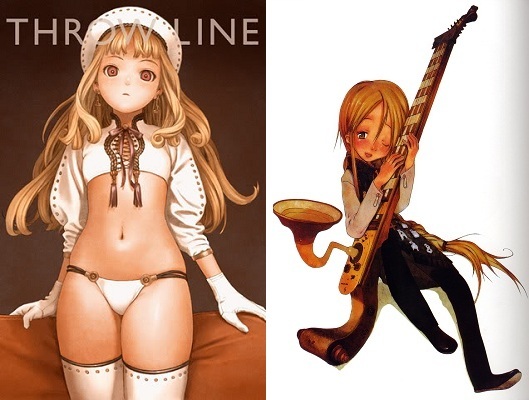 Okama tells us he’s imitating Range Murata here. I think he is going for a similar tonality. In any case, it’s Okama’s Murata. This is a marvelous picture and it brings to my mind Shakespeare’s Ophelia (before she drowned herself). What looks like a wing is of course made of plastic. And Okama thinks she’s bald. But she’s still pretty. I think the lesson is: don’t be scared to accessorize. It’s difficult to determine where the ears end and the cloak begins. You need to read Cat’s World to figure this out. Lots of moons. This girl is probably related to the one in 036. 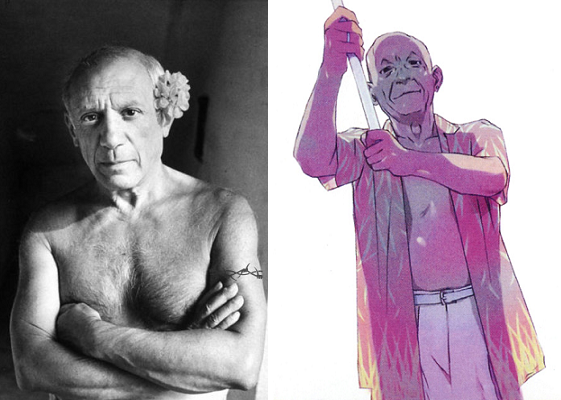 That the man is identified with Picasso might be Okama’s ruse to distract us from the magical writing on the sacred wheel. Socldaire cubirle du Salo* /щщщ щanico*. That can’t be good. I love this pic and used it in my post Esoterico-elemental Artistry. She nonchalantly makes as if she has a gun with her right hand while in fact she’s hiding a gun in her left. And to top it off she’s pointing one way while looking the other. I share Okama’s puzzlement when he implies that he wasn’t allowed to dot the girl’s face with freckles. I don’t understand why freckles aren’t more popular. This is an older picture and it shows. Okama gets nostalgic when he looks at it. Okama doesn’t comment on this picture, but the outfit does make sense if the people in this pond never jump into the water, they use their legs to paddle and thus need protection. Of course, the huge fish on the top right corner destroys the whole theory but maybe it’s a flying fish. Little girls shouldn’t do eat mushrooms. Foreheads reaching critical proportions. It’s gotten so bad all of the nutrients are going to the girls’ heads. Okama makes slavery look positively wondrous. Bottom line: if Princess Canaria were animated I’d watch it. Okama can do settings with lush backgrounds and he can do without them altogether. The wine color is beautiful. Okama keeps having to defend his forehead fetish. The girl is surrounded by 10 of the 12 animals of the Chinese Zodiac. Only the dragon and the monkey are missing. I think it’s reasonable to suppose that the artist himself is the 11th animal and that the girl is the 12th. Okama probably thinks of himself as the (playful) monkey here, which means the girl is the dragon. This dark story presents a contrast with “Filtered” both in terms of background and in terms of mood. I think if you put both of these stories together then you get “Camellias”. That is, for Okama, there is a beauty in the world and it’s absolutely stunning, but it is not to be found in social strictures and structures. “Filtered” is joyous because all of these structures are absent. “Morning Suicide” is sad because they are so present. And in “Camellias” the main character manages to escape from one situation to the other. ~ by Haloed Bane on April 25, 2011. Will read your commentary and the book later when I have time (finals week) for now: did you know that Okama does art supervision for the current anime Astarotte no Omocha? You can very much see it and it is glorious. I recommend it. And that’s why 44’s the credit page.